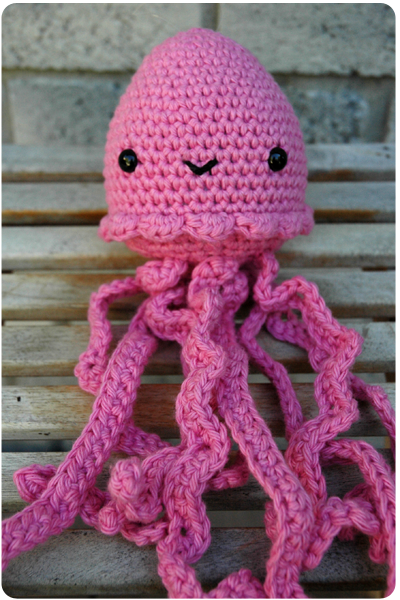 After making an owl and a frog princess, I decided to pick a theme for my crochet toy making - sea animals. 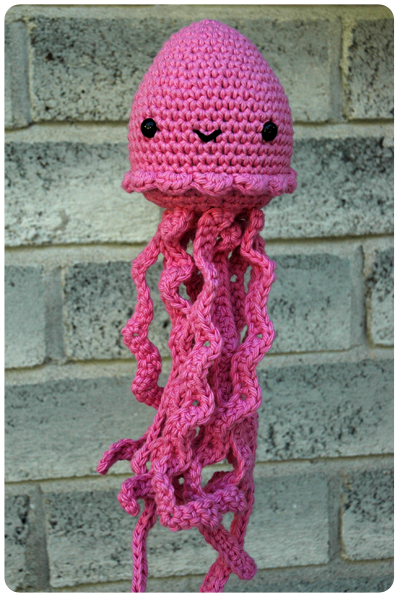 To start my little group of ocean friends, I made a a jellyfish. Like the frog princess, the pattern for the jellyfish can be found in this incredible book. This is a great pattern book; the toys are adorable, and the patterns to make them are so simple to follow. I highly recommend this book if you are at all interested in crocheting toys. Positioning and sewing on all those legs was a bit of a chore, but so worth it. Isn't he cute? I love his little smirk. Any guesses as to what ocean friend I made next? This is so cute - great job! How stinking cute is this?? I might die! Hi, this is so cute! You did a great job making this. I saw it on life on lakeshore drive.